There are two rabbits who will confuse you like some riddle out of Alice and Wonderland. There are times I’m confused which rabbit is which and I took the photos. Rabbit Playing Cymbal is in the Hirshhorn Museum’s just a long stone’s throw from the National Gallery of Art’s Sculpture Garden that includes Thinker on a Rock featuring a similarly-looking rabbit. 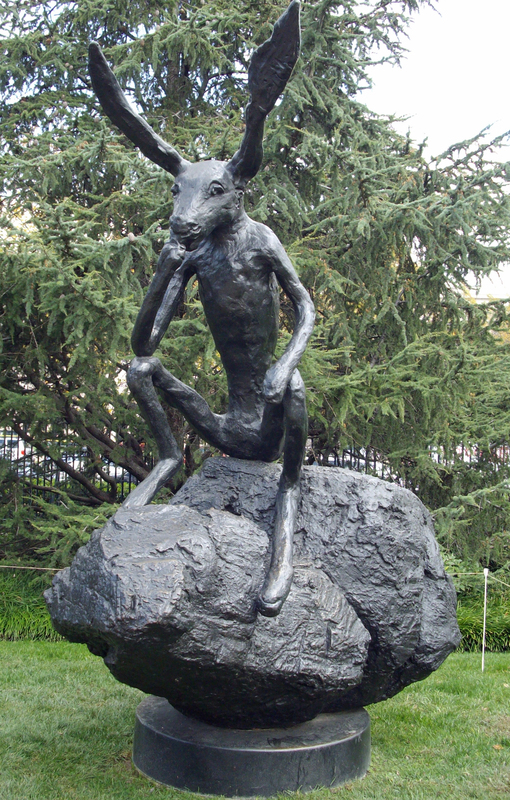 Maybe it’s the same rabbit and it just outruns me from one to the next. Rabbit Playing Cymbal is a bust for me. I couldn’t find any information on it despite my best attempts. Maybe a reader can help out. UPDATE – Thanks to a reader I learned Rabbit Playing Cymbal is also by Barry Flanagan. No wonder the two reminded me of each other since Flanagan did both. 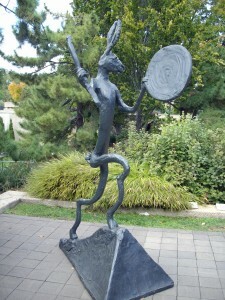 This entry was posted in Monuments and Statues and tagged best DC walking tours, Hirshhorn Museum Sculpture Garden, National Gallery of Art Sculpture Garden, Photos by Rick Snider, Rabbit Playing Cymbal, Thinker on a Rock. Bookmark the permalink. Thanks for the help. There’s always someone out there who knows the answer. Neat! Those are definitely different.